Showing 51 articles from July 17, 2013. LOUISBURG — A store that has served farmers and others with green thumbs for nearly 30 years will shut its doors next week. 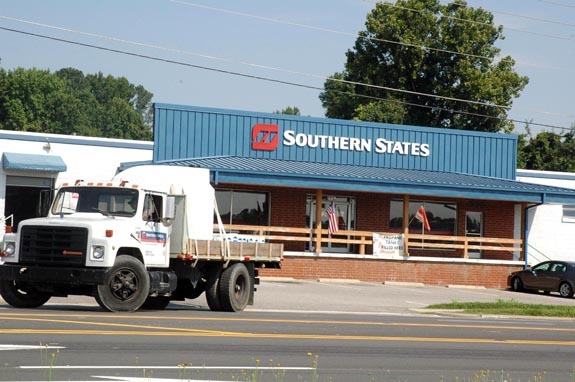 Southern States Cooperative announced that it will focus on its new Agronomy Business Unit to better serve growers in the field. Most Franklin Countians should be forgiven if they took a quick look at this photograph and thought they saw a new species of blue and white mushrooms or toad stools. After all, those fungi have been popping up like crazy during this unusually wet summer. But on closer look, you’ll notice that they are people heading across the Louisburg College campus trying to dodge those frequent rain drops by using umbrellas in the school’s colors. Sheriff’s deputies arrested two people accused of robbing a man at gunpoint before shooting him in the back. Robert Royster recovered from the injuries suffered during the June 10 home invasion. On July 7, investigators arrested Nakisha N. Stewart, 27, for her role in the robbery. 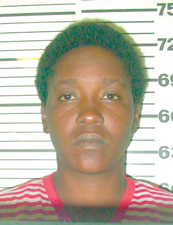 On July 12, deputies took Shakema T. Strickland, 22, into custody at the sheriff’s office. The filing period for November’s municipal races doesn’t end until noon Friday, but already residents can expect some new names on the ballot and new bodies in elected offices. Youngsville residents can expect to see the most change as longtime Mayor Sam Hardwick said he won’t seek re-election. Franklin County’s Board of Elections has some new faces, and a familiar one in a new place in both administration and policy setting. 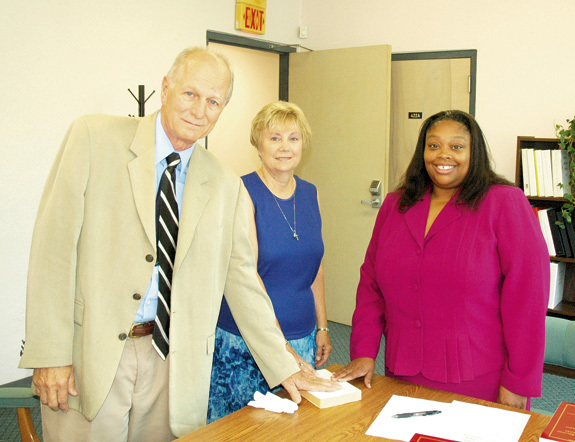 Sonravea Privette and Amy Southerland were both sworn in this week as the newest members of the county’s Board of Elections. Meeting in a special called meeting only to discuss personnel items last Thursday night, the Franklin County Board of Education agreed to hire Dr. Cheryl Benson as the district’s new assistant superintendent for Human Resources. She replaces Lynn Henderson, who retired at the end of June. Dr. Benson is currently assistant superintendent for human resources for Hoke County Schools in Raeford. Putting a jail before kids’ safety explains a lot! Franklin County could not find about $600,000 to make our elementary schools — and the nearly 4,100 students who attend them — safer. But, Franklin County can quickly find $2 million or so to rebuild a jail that’s too new to need rebuilding and which houses people who intentionally violated the laws of our society. Seeing ourselves as others see us hurts! When the headline reads “The decline of North Carolina,” you know it’s going to be a bumpy ride. It was — and it will have a profound effect on North Carolina despite what politicians in Raleigh will say. In case you didn’t read it, we’re referring to an editorial that ran last week in the New York Times which — to be kind — took the leadership of this state to task for a series of decisions it said was hurting the state and the people who call it home. To be fair, municipal elections can be underwhelming. I’m not expressing opinion. I’m merely stating fact. Compare municipal elections results to those of a general election involving commissioners, the sheriff’s office or the president. Moral Monday participants are individuals of various professions, races and political persuasions who come together in Raleigh each Monday because we believe it is our moral obligation to continue to reach out to the N.C. General Assembly to appeal to them to stop passing immoral laws. Would tips from town help stop thefts? Enjoying friends and neighbors during the holiday, I shared a recent neighbor’s theft problem of tools. Everyone had a recent story about the theft of tools or copper to share, five within a two-block radius. How many more do we not know about? Alert puts the ‘A’ in America! A friend, Melanie Bobbitt, invited me to attend Alert’s Annual Independence Day parade and I am happy that she did. What a rewarding and wonderful experience. This year was the 12th year they have held the parade. There were tractors, fire trucks, all-terrain vehicles, plenty of flags, the beautiful Princess of Mule City; Miss Haleigh Baker, fancy cars, and even Uncle Sam; Kenneth Radford and his “PR” team Mike Foster showed up. The morning of July 10 began like most for me. As I settled in, I began my perusal of newspapers including the New York Times. The lead editorial was The Decline of North Carolina. 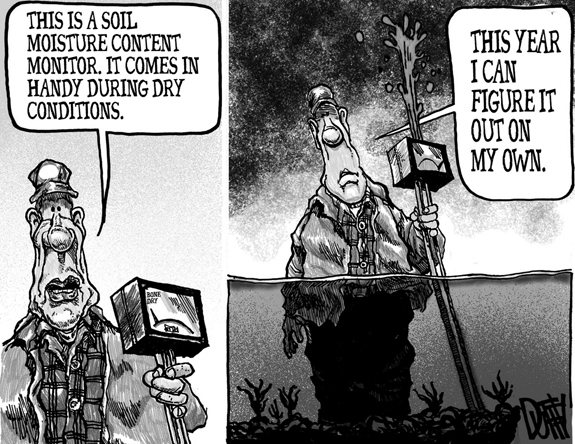 According to four International Media and Newspapers, the five most influential newspapers in the world are American or UK publications. LOUISBURG - John (Val) Valovich, 70, formerly of Hazleton, Pa., died Tuesday unexpectedly in Hazle Township, Pa. His funeral will be held Saturday at 9:30 a.m. from the Harman Funeral Homes and Crematory, Inc. (East), 669 W. Butler Drive, Drums, Pa., followed by a Mass of Christian Burial in Good Shepherd R.C. Church, Drums, at 10 a.m. Burial will follow in Mt. View Cemetery, West Hazleton. Friends may call at the funeral home Friday evening from 6-9 p.m.
Our beautiful mother, grandmother, sister, aunt and friend, has left us for her next adventure. We will love and miss her all the days of our lives. Born June 11, 1953, to Lizzie Gray Denton Hagwood, she has gone to be reunited with her, her father, Doyette Gaylon Hagwood, and her sister, Gail Finch. HERTFORD — Nina Marie Perry, 82, died Friday, July 12, 2013 as the result of a traffic accident. Graveside services will be held at 3 p.m. Saturday, July 20, at Rosewood Memorial Park in Virginia Beach, Va.
LOUISBURG - Shelton Avery Guy Jr., 43, formerly of Magnolia and Cary, died Sunday, July 7, 2013 at his home. FRANKLINTON— Archer Woodrow Phelps, 84, of Franklinton, died at Wake Medical Center in Raleigh on Wednesday morning, July 3, 2013. FRANKLINTON— Charles Earl Pender, 71, died Wednesday, July 10, 2013 at Franklin Regional Medical Center in Louisburg. Service was conducted at Kinches Chapel Church, 1066 Gordon Moore Road, Franklinton, on Wednesday, July 17, with the Rev. Diane Reeder officiating. WAKE FOREST —Rose Bailey Tilley, 73, died Thursday, July 11, 2013 at the William M. Dunlap Center for Caring. Funeral services were held Sunday, July 14, at Glen Royal Baptist Church with the Rev. Robert Faile officiating. Burial followed in the Wake Forest Cemetery. NOT THIS TIME. 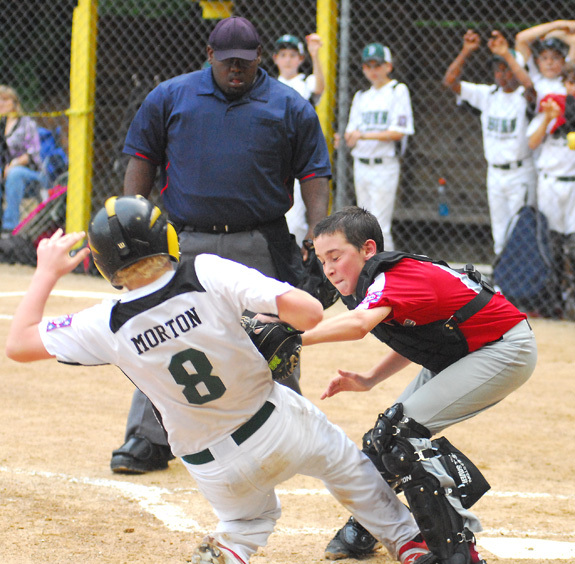 Bunn piled up the runs during the Dixie Youth Major League District Tournament, but this wouldn’t prove to be one of those occasions at Bunn’s Caleb Morton is tagged out at home plate by Youngsville catcher Spencer Callihan. 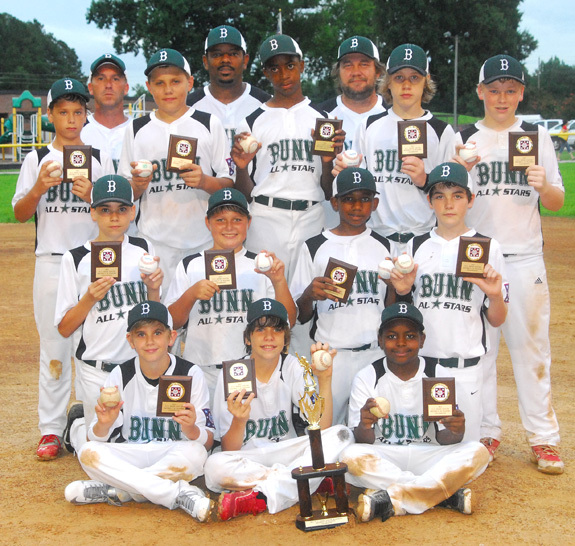 BUNN -- Every triumphant act deserves a climactic finish -- and that’s what the Bunn All-Stars provided at last Friday’s championship game of the Dixie Youth Major League District Baseball Tournament. 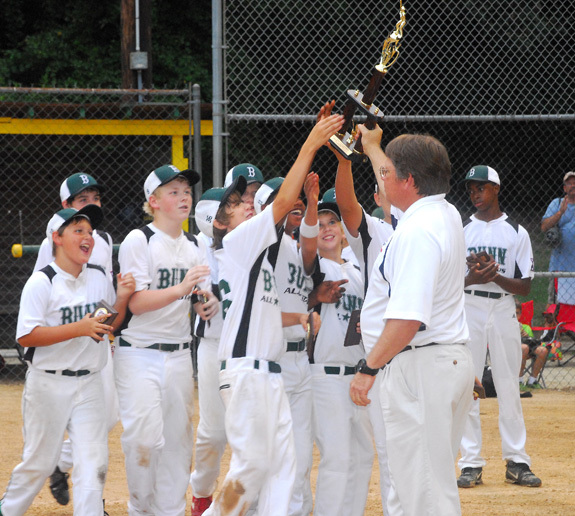 After rolling through its tourney competition, Bunn closed out its crown in style with a 10-0 victory over Youngsville at the Bunn Elementary School Field. TC’S SPEED RACER. Town and Country’s Claire DeJesus prepares for her event during Monday’s home swim meet against Winchester out of Raleigh. LOUISBURG -- After some time off due to poor weather, Town and Country tangled with long-time rival Winchester on Monday in area swim league action. Winchester was able to secure a 254-175 victory, marking the first team defeat of the campaign for the Stingrays. 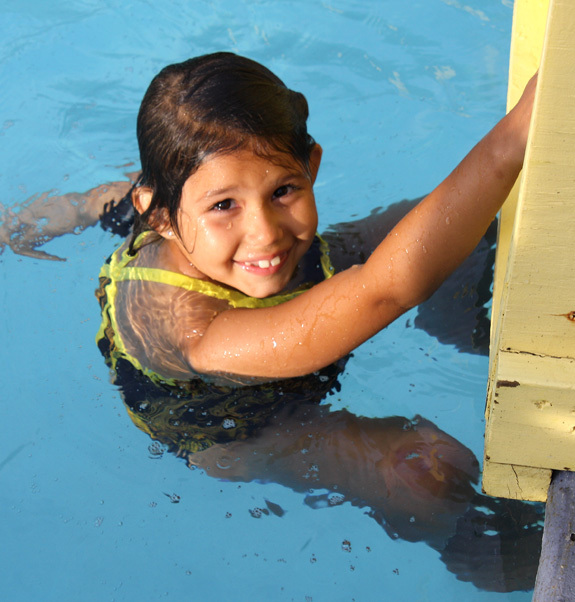 There will be a rematch between the clubs today, this time at the Winchester Pool in Raleigh. 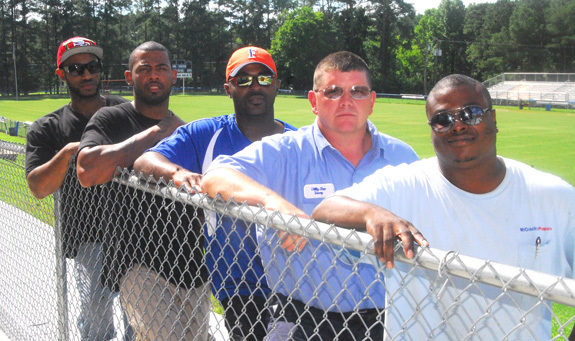 LOUISBURG -- As someone who made the successful transition from Saturday mornings to Friday nights, Mike Epps knows all about the positive impact football has had on his life. Epps starred as a youngster for the Louisburg Lions’ gridiron program before enjoying a successful career at Louisburg High School before graduating in 1997. The inevitable onset of age has a way of making us appreciate some of the finer aspects in life -- things that might go unnoticed to a younger person embarked on a relentless climb up the corporate ladder. Now 53 years old and four seasons removed from his last stint as Bunn High School’s football coach, David Howle never understood how good it felt to be on the practice field -- until he returned to the grass two weeks ago. LOUISBURG -- Louisburg College’s volleyball squad, coached by Colby Mangum, will begin its 2013 campaign Aug. 31 with a road tri-match at St. Andrew’s College. LC’s first home event will be Sept. 3 at 6 p.m. against Region X foe Pitt Community College. FREDERICK, MD. -- The Frederick Keys scored six times in the first inning and pulled away for a 12-2 win over the Carolina Mudcats on Monday night at Harry Grove Stadium in a Class A Carolina League baseball matchup. The Keys (10-13, 44-49) salvaged a split of the four-game series and the Mudcats (11-12, 33-60) finished the road trip with a 4-3 mark. TOURNEY CHAMPS. 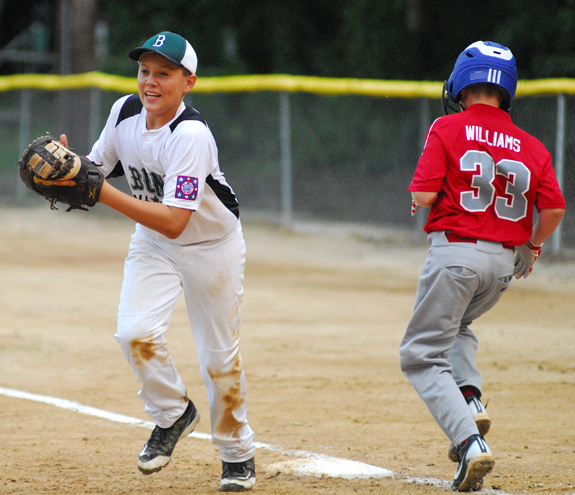 The Bunn All-Stars claimed the crown at the Dixie Youth Major League District Baseball Tournament, which concluded last Friday at Bunn Elementary. Pictured are (back row, l to r) Coaches Willie Scott, Antonio Wilson and Jerry Shirley; (third row, l to r) Tanner Dixon, Kyle Kettells, Jacoby Rogers, Zack Shirley and Caleb Morton; (second row, l to r) Noah Scott, Preston Moss, C.J. Alaffita and Cameron Champion; (front row, l to r) Jackson Taylor, Jackson Neal and Jaylen Perry. TROPHY COLLECTION. The Bunn All-Stars accept the Major League District Tourney title from District Director Bruce Tant. THE CHAMPS. 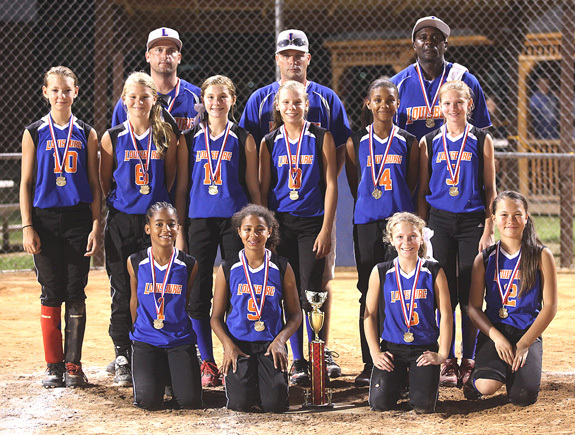 The Louisburg All-Stars claimed the title at the Tar Heel 12-Under District Softball Tournament, which was held last week at Louisburg High School. Pictured are (back, l to r) Coaches Lee Salter, Shawn Schlafer and Travis Saunders; (middle, l to r) Katelyn Robbins, Taylor Ferguson, Jenna McKenney, Ramsey Schlafer, Ikesha Little and Kaci Roberson; (front, l to r) Shanna Scott, Kaylee Saunders, Casey Salter and Vickie Finger. 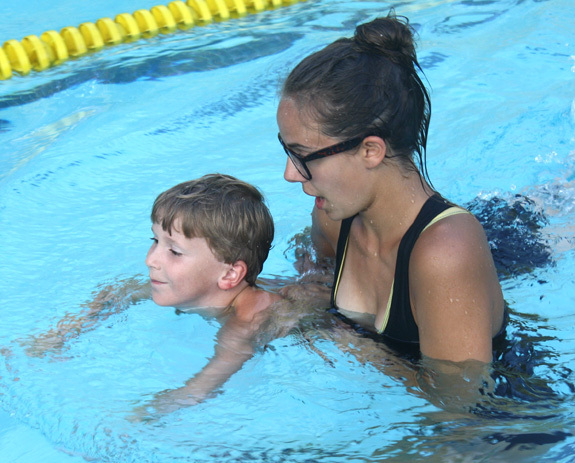 Town and Country assistant coach Lindsay Harrison (right) aids Rays’ swimmer Sutter Cheshire. 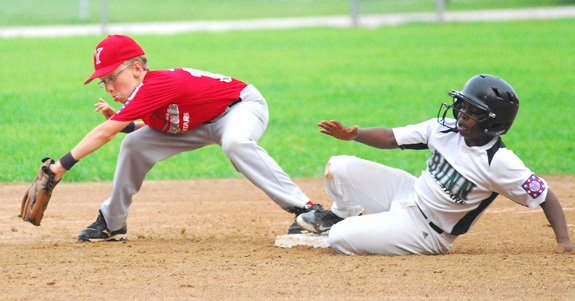 Bunn’s Jaylen Perry (right) swipes second base as Youngsville’s Jonathan Jones retrieves the throw during last Friday’s title game at the Dixie Youth Major League Tourney. Bunn All-Stars first baseman Kyle Kettells (left) is all smiles after registering the final out of the Dixie Youth Major League Baseball Tournament, which wrapped up last Friday. Jessica Robyn Jones of Wendell and Jonathan Ross Burgess of Centerville were united in marriage May 18, 2013 at 3 p.m. at Knightdale Baptist Church. The Rev. George Pullium Jr. officiated at the ceremony. 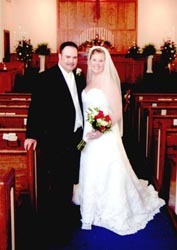 The bride is the daughter of Mr. and Mrs. Bob Jones of Wendell. She is the granddaughter of Frances Wall and the late Sigma Wall of Knightdale and the late Mr. and Mrs. Carison Dennis Jones of Wendell. Wayne and Linda Pippin of Bunn announce the engagement of their daughter, Christy Ann Pippin of Bunn to Christopher John Wilder of Lake Royale. The groom-elect is the son of John and Christy Wilder of Spring Hope. 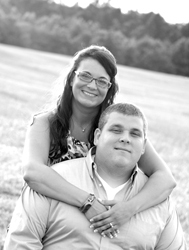 The wedding will take place on Oct. 5, 2013 in Bunn. Michael Douglas Medlin will be graduating from Florida State University on Aug. 3, receiving a Bachelor of Science degree, with a major in psychology and a minor in sociology. He is the son of Andy and Kim Woodson and the grandson of Douglas and Donna Medlin of Louisburg. 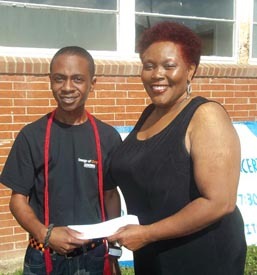 The Perry’s School Alumni Association awarded a $500 scholarship to Jordan Isaiah Wright, a graduating senior from Louisburg High School. He graduated with a 3.34 GPA and plans to attend North Carolina A&T State University in the fall and major in graphic design. He is the son of Mr. and Mrs. Tracy Wright of Louisburg. 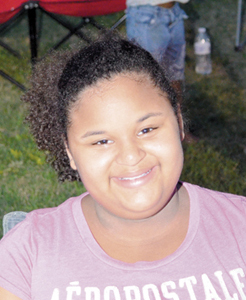 Crystal Williams has received the Golden Anniversary Scholarship from the Delta Kappa Gamma Society International. 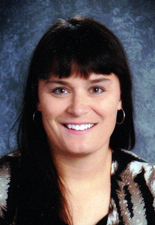 Williams is the curriculum resource teacher at Edward Best Elementary School. LOUISBURG — A Franklin County man convicted of dog fighting avoided jail time, partly due to his willingness to find better homes for the animals. On July 3, Superior Court Judge Bryan Collins gave Malcolm Boyd until this past Wednesday to find homes for about 15 dogs that officers left in his care after raiding his Tollie Weldon Road property in December. The producers of the movie Jackson’s Run and founders of the Impact Challenge Christian Youth Weekend, Chris Robinson and Ollie Ballew, are bringing their Impact Team to North Carolina from July 26-28. The three-day event will be held at the Norris Creek Outdoor Entertainment Complex, 751 Old Halifax Rd, Louisburg. YOUNGSVILLE — In the coming weeks, Youngsville’s officers might be mistaken for vacuum cleaner salesmen, insurance pushers, Girl Scouts or your run-of-the mill door-to-door sales. 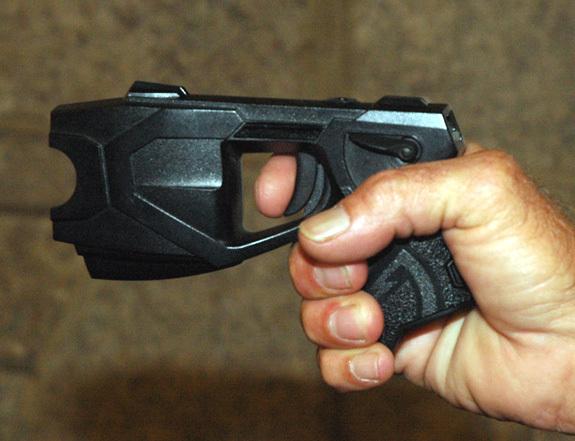 Town commissioners gave them approval last week to solicit businesses for money they need to buy Tasers, non-lethal weapons that officers say they need to fight escalating crime. The Franklin County Economic Development Commission has unanimously voted to endorse incentive programs for two businesses. The endorsements, for White Street Brewing Company and Xerium, are scheduled to go before the county commissioners at their Aug. 5 meeting. YOUNGSVILLE — Businessmen who plan to turn a vacant building into a center for town development have said they will do so without the aid of a state grant. In June, Youngsville commissioners agreed to endorse a grant application that would have helped Matthew Winslow and Tim Gray renovate the Boondocks building at the corner of Main and N. Cross streets. Franklin County sheriff’s deputies are investigating a series of vehicle break-ins. Residents in a Youngsville area subdivision reported that someone broke into two dozen vehicles between the evening of June 30 and the early morning hours of July 1. Only one of the vehicles was reported to have been locked prior to the crimes. The Franklin County Arts Council got the green light for a fall music and street painting festival in a unanimous vote from the Louisburg Town Council Monday night. The vote came in one of the shortest council meetings in months -- about 15 minutes -- and allows the arts council to hold its festival from 10 a.m. until 4 p.m. Saturday, Oct. 5.